When you’re looking to add some pressure washing support to your garage, you’ll need to find the best washer out there. You don’t want to buy a lemon, though. Each pressure washer has its quirks and strengths that you’ll want to know going in. In this article, we’ll review a handful of the best pressure washers so that you will know which will give your vehicle a great clean and which will leave you searching for a sponge to finish up the job. How Long Should I Expect My Pressure Washer To Last? What Nozzle Attachments Do I Want? 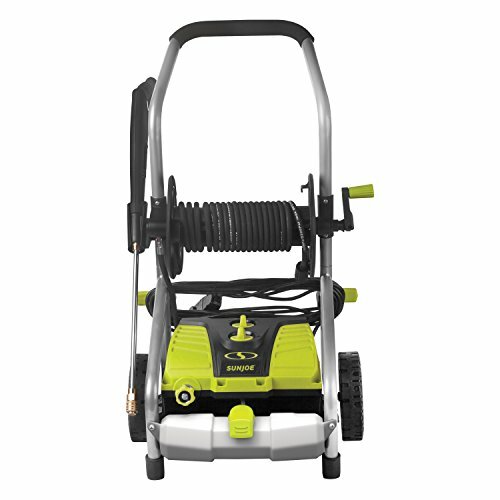 The Sun Joe SPX3000 Pressure Joe 2030 PSI 1.76 GPM 14.5-Amp Electric Pressure Washer has a handful of great features which will make it an excellent addition to your garage. The Sun Joe SPX3000 has five spray tips, which means that every task has its proper tip. These tips include a 0 degrees, 15 degrees, 25 degrees, 40 degrees, and soap tip. Each of the tips is for a heavier wash than the last, so it’s possible to get an extremely powerful wash with this washer. The 14.5amp motor can output up to 2030 psi. This means that the washer is so powerful that it can be genuinely dangerous if you aren’t careful. The maximum water input temperature is slightly over 100 degrees Fahrenheit, so you can get a nice warm suds if you use soap. The washer has a dead man’s trigger, so it won’t tax the engine any more than is necessary. This contributes to the unit’s lifetime. You won’t need to stop and restart work to reload your detergent tanks with this washer thanks to its dual 0.9L tanks. You can remove the tanks easily and keep several types of liquids ready to substitute in using a spare tank, which is a great feature in contexts where you’ll need more than two liquids to perform a wash. Overall, this power washer is excellent, but you may not like its durability. Mechanical issues are common in all pressure washers, and this unit is no exception. Using the washer on lower power chronically will prolong its lifetime, as will purchasing a three-year protection plan or extended warranty. The Sun Joe SPX4001 2030 PSI 1.76 GPM 14.5 Amp Electric Pressure Washer w/ Pressure Select Technology & Hose Reel is a power washer that’s ready for outdoor use and in functions other than washing cars. Thanks to its simple design, this power washer is lightweight and ready to rock when it comes to cleaning tasks around the garage or elsewhere around the house. Its maximum power is still very potent at 2030 psi, however. The power washer’s settings include a 1450 psi option and a higher power option. As with the other Sun Joe power washer, you’ll get a selection of five different tips which can be fitted to supplement the two power settings. This power washer is lightweight and far more maneuverable than others. While you may not always appreciate these features in the garage, this power washer is a great general-purpose unit. The only problem with this unit is its small storage capacity, of which there is none. You will need to connect this unit to a liquid source using the hose. This drastically limits the lightweight utility of the unit in many cases. 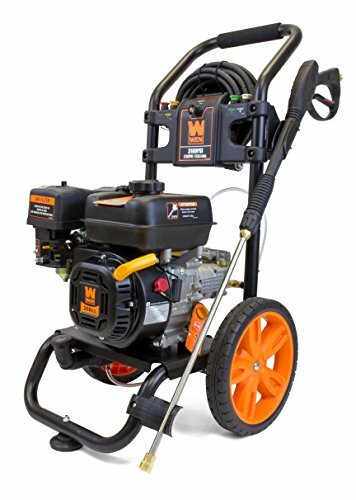 The WEN PW31 3100 PSI Gas Pressure Washer, 208 cc uses a gas-powered engine to supply a truly massive amount of pressure. With this pressure washer you’ll have the ability to project 3100 psi of force. Most other pressure washers can’t possibly hope to compete. Even the toughest and most built-up grime will be blown away without any problems. The way this washer is capable of outputting this kind of force is by its gas-powered engine. You’ll need to keep a bit of gas on hand and be prepared to refill the unit frequently. The same goes for the onboard soap tank, which is fairly small given the unit goes through 2.5 gallons per minute. The engine is air-cooled, which means you may have some issues with overheating if you use it while in the direct sun and in a hot environment for an extended period of time. For most purposes, the air-cooled engine won’t pose any problems, and garages will be fine. The hose on this unit is 30 feet long, which is a bit longer than other pressure washers. When paired with the great wheels on the unit, you can expect to truck this washer around the garage without any hassle. 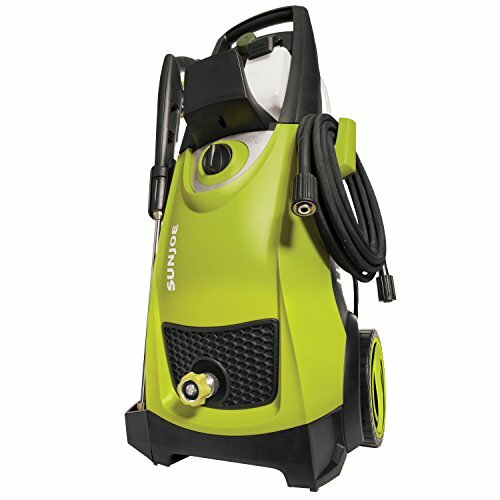 The Stanley SHP2150 Electric Pressure Washer with Spray Gun, Medium, Yellow is an excellent pressure washer solution for professional car washes. 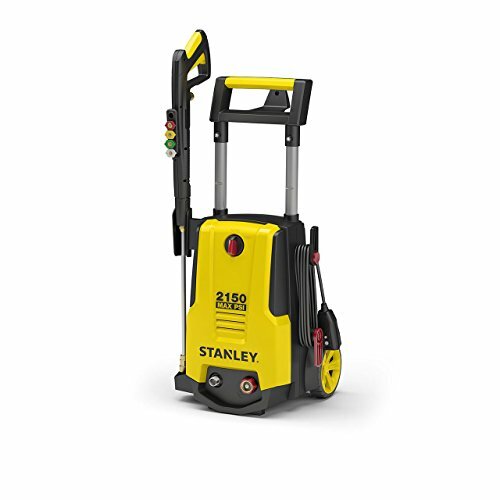 With this Stanley pressure washer, you’ll be able to output 2150 psi. More importantly, the unit comes with all of the replacement parts that you might need. Everything from nozzles to o-ring replacements are ready to go. Nonetheless, this unit is very reliable. The connection points of the hose are especially strong. The connectors are made of brass, and fit to a standard 22mm port. The gun part of this pressure washer is a little bit unwieldy because of its size, however. Paradoxically, the comfort features like the pistol grip and trigger guard make the unit a bit harder to use and much heavier. So, while your hand will be plenty comfortable while using this pressure washer, hand comfort isn’t something that most pressure washers struggle with anyway. The biggest advantage that the hand comfort features provide is better grip when wearing gloves. If you plan on wearing heavy rubber gloves while cleaning cars, the added comfort features make for a better experience than narrow guns, which may be harder to handle with less dexterity. 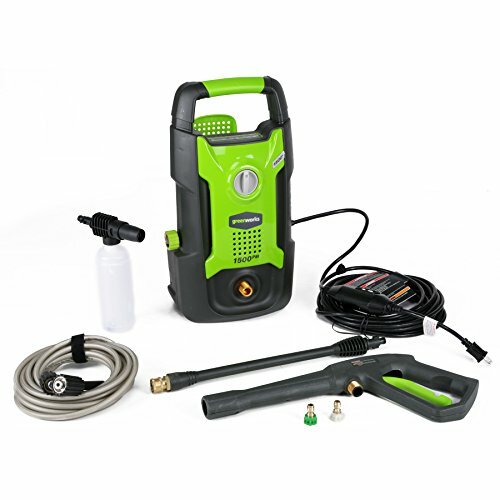 The Greenworks 1500 PSI 13 Amp 1.2 GPM Pressure Washer GPW1501 is a super-portable pressure washer which makes up for its low psi output with its convenience. The main appeal of this pressure washer is that it’s handheld and can be backpack-mounted. Because the unit runs on a battery, the limiting factor will be the length of the hose. The hose itself is as long as the power cord which is optional to connect. This means that you can get to difficult areas without needing to unplug and replug. While this pressure washer has a handful of hose attachments, they don’t add too much power or focusing. So, while this is a great washer for casual car cleaning, it probably isn’t enough for a serious car wash to use as their primary washer. 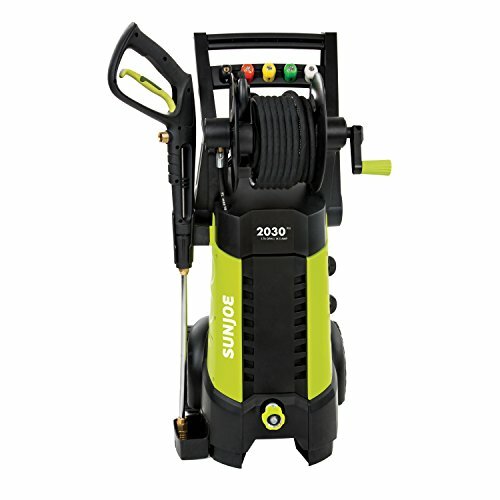 The Sun Joe SPX3001 2030 PSI 1.76 GPM 14.5 AMP Electric Pressure Washer with Hose Reel, Green is capable of blasting cold water at any vehicle with all of the pressure you’re ever need. Much like the other Sun Joe units, this unit has five tips, a 2030 psi capacity, and a 20-foot hose. These features make the SPX3001 a formidable power washer, as does its dead man’s trigger to prolong the engine’s life. With the output of this power washer, you can expect to go through 1.76 gallons per minute of fluid. You’ll need to attach the power washer to a cold water source before going to town with the pressure. The only issue to be aware of is the narrow hose length. The hose on this washer is 1/4th of an inch, which is fairly narrow. For the purposes of throughput, this isn’t a problem. But, if you live in an area where there are high levels of minerals in the cold water source, you may need to desalinate or descale the power washer if you haven’t used it in a while. During a run of the power washer, there’s no accumulation of minerals, of course. There’s simply too much pressure. After a session has concluded, however, the minerals can calcify on the insides of the hose. This problem is especially bad where the hose meets the tip and where the hose meets the pump. If you use the washer frequently, the minerals will get blown away, but if there are long delays between washing sessions, they may be tough enough to resist the pressure, so be aware. If the minerals build up for too long, you will potentially get overpressure which will damage the engine. 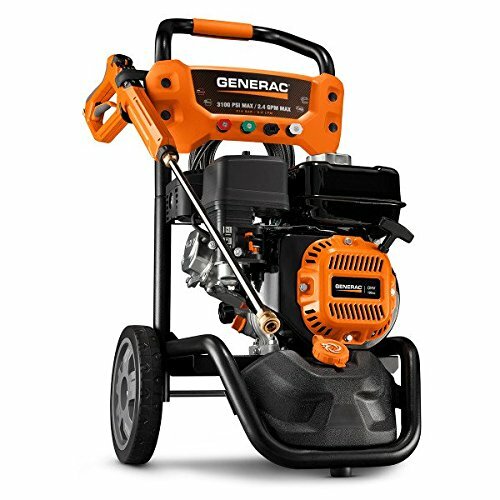 The Generac 7019 OneWash 3,100 PSI, 2.4 GPM, Gas Powered Pressure Washer and PowerDial Gun is another beast of a gas-powered pressure washer. Like other gas-powered pressure washers, the Generac is ready to output 3100 psi for the hardest cleaning jobs. You can shoot the high-pressure stream up to 25 feet in the air, which makes it great for multi-purpose use. It’s also strong enough for use in any kind of serious car washing application. Few specks of grime can resist the pressure which this washer can output. The detergent tank is only half a gallon, however, so you should expect to need frequent refills. The portability of this unit is fairly high thanks to its independent engine and great wheel system. The gun is a little bit bulky, but it’s ergonomic enough for any kind of intense cleaning job. The four nozzle attachments also provide a lot of versatility for your cleaning efforts. The main features that you’re looking for in a pressure washer are maximum psi, liquid reservoirs, and portability. You need a maximum psi that’s high enough to dislodge the most resistant clumps of dirt on your vehicle. You don’t need an industrial-strength water laser, however. For most purposes, anything upwards of 2000 psi is enough. The size of liquid reservoirs is directly related to the pressure that the washer exerts. Higher levels of pressure require larger reservoirs to wash for the same amount of time. Most units use a hose to free the washer from its reservoirs, which tend to be depleted quickly. Finally, you need a pressure washer that is at minimum portable enough to truck around the garage without any trouble. Heavier pressure washers can be too heavy, even when they have wheels. On the other hand, pressure washers which are too light probably have small reservoirs and probably can’t output much pressure. When in doubt, get a pressure washer that’s easier to move than one which is more powerful. You use the pressure washer actively, so if it’s too cumbersome it will increase your hassle by a large amount. Pressure washers tend to be finicky instruments even when they are taken care of properly. The high power flowing through the engines tends to make them wear out quickly. Likewise, mineralization of the nozzles or hoses can rapidly take them out of commission. Most pressure washers should last about two years with heavy use. Lighter use doesn’t necessarily prolong their life by all that much thanks to mineralization issues. At most, you can expect a pressure washer to last five years. Most people don’t perform any kind of maintenance on their pressure washers, but you may be able to get a bit more time if you do. Should I Get A Gas Pressure Washer Or An Electric Pressure Washer? Gas versus electric is a matter of personal preference. Gas-powered washers can be more independent, but they’ll still need a liquid supply. They also tend to output a lot more power and have a little bit more durability. Gas-powered washers may be reluctant to start after being left in storage for a long time, however. Likewise, their engines can overheat or become flooded. Electric powered washers require less finesse, but are generally less powerful and can easily trip a fuse if you connect them to the wrong socket. While a few units have batteries, most electric units will need to be plugged in to operate. Electric units also tend to be lighter weight, so they might be more portable in some cases. Most units fit a handful of nozzles which are sold standard with the unit. These nozzles are intended to provide more power. Some claim to be more useful with soap than others. The truth is that the nozzle attachments are probably not as important as manufacturers claim. Fitting the narrowest nozzle will provide the best cleaning characteristics for cars most of the time regardless of other factors. The downside is that smaller nozzles have a higher chance of clogging due to mineralization. Smaller nozzles also have a higher chance of being hard on the engine via backpressure, but most manufacturers realize this and compensate accordingly. Larger nozzles provide less pressure and less focus, which is generally not helpful. Likewise, nozzles intended for use with soap are not necessarily any better for projecting soap than the other nozzles. Medium-sized nozzles are also dubiously helpful. In short, you want to get at least one small nozzle for your washer.